This Naja pendant is formed with a heavy-gauge piece of hammered ingot triangle wire that flattens towards the opening of the horseshoe shape where it's decorated with a series of graduated starred buttons. A free-swinging cross hangs in the center of the pendant. 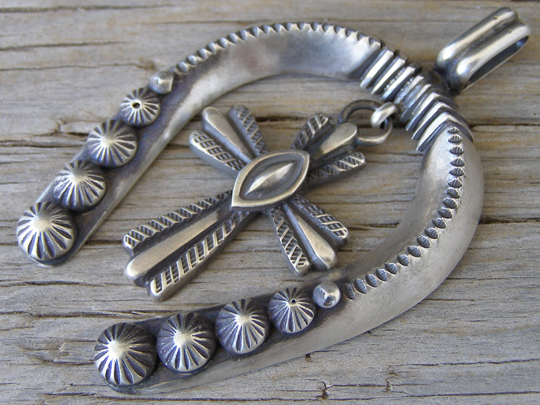 The bale on this will accommodate Erma Arviso's antiqued Sterling beads up to 4 mm. diameter. Fantastic! Dimensions of pendant (excluding bale & jump ring): 2 1/4" x 1 3/4"